Wakol PU 225 Adhesive is a two-part adhesive suitable for engineered and solid wood flooring. Ideal for use with wide plank flooring where a solid firm bond is required. You can use it for underfloor heating system. Pour hardener into the adhesive and mix with an electric whisk stirrer for 3 minutes until fully mixed. Mixing ratio: 8 parts adhesive to 1 part hardener. Wakol PU 225 Adhesive has an open time of approximately 50 minutes. Please note, we recommend you to wear gloves during handling because it turns the hands black. 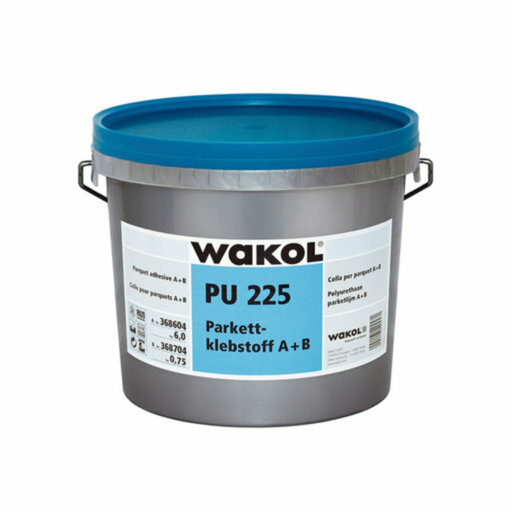 Wakol PU 225 comes in a 6.75 kg tub, component A and a hardener - 0.75 kr, component B.